One hundred and eleven musicians celebrating a large-scale symphony that sounds like Gustav Mahler, Richard Strauss or Arnold Schoenberg. In fact, the composer of this symphony, Alfred Schnittke, had precisely these composers (and many others) in mind back in 1981. Whereas he initially mirrored certain styles from such figures as Mahler, Mozart, Bach, Stravinsky, Prokofiev and Shostakovich, he was soon also borrowing concepts from �trivial music�, folklore, jazz, tango, and many other styles. He himself described his compositional technique as �polystylistic�, which was more than just a technique, but an aesthetic programme: a serious effort to break through the vicious circle of the self satisfied and self sufficient avant garde music. 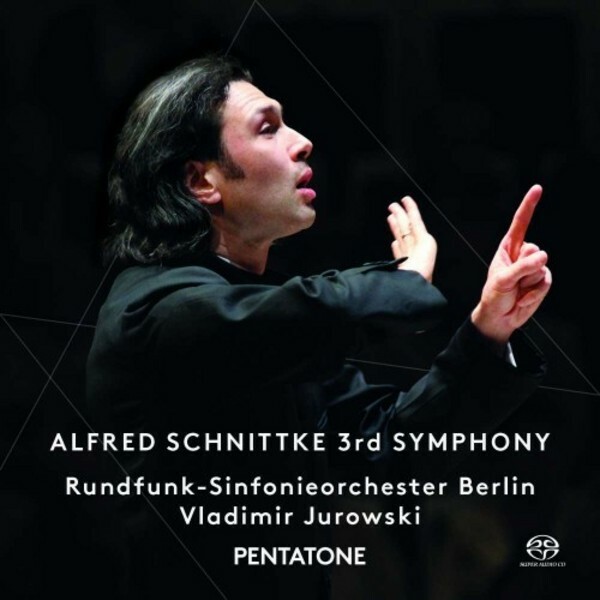 Alfred Schnittke�s 3rd Symphony testifies all this searching, this 'in-betweenness'. The four-movement work � an opening Moderato , followed by an Allegro, a long movement marked Allegro pesante, with the briefer finale marked Adagio � was commissioned for the ceremonial opening of the new Gewandhaus in Leipzig. He used the prestigious commission from Leipzig as a moment to confront not only the multi-layered historical past, but also the weakened current state of affairs while remaining highly respectful of the achievements of both the past and the present. Released on SACD by Pentatone, this symphony is recorded with Vladimir Jurowski conducting the Rundfunk-Sinfonieorchester Berlin. The conductor's insightful, unique reading, and his collaboration with an orchestra who are on top form, undeniably produced nothing less than a magnificent tribute to Schnittke�s great and intricate score.